The MSI CR610-013UK is a widescreen media centre laptop which provides Blu-ray functionality. 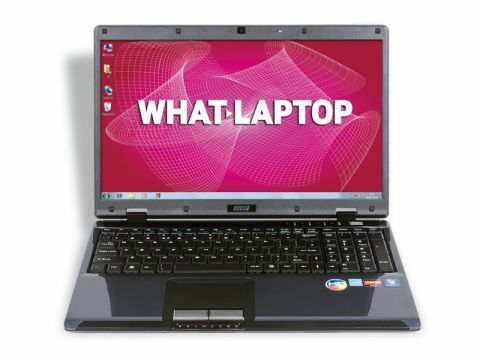 While Blu-ray laptops are becoming increasingly common, it is still rare to find them for less than £599. Letting you watch the latest high definition (HD) movie releases, the inclusion of a Blu-ray drive is the key selling point of this laptop. Of course, a movie is only as good as the screen you watch it on, but thankfully the 16-inch widescreen panel used here is excellent. With impressive brightness, colour and contrast, photos and videos look great. However its worth noting that the Super-TFT screen coating is highly reflective, and it lacks a Full HD 1080p resolution. Where this machine misses a trick is in its limited graphics performance. While HD video runs comfortably and smoothly, a powerful graphics card would have added to its multimedia potential. Unfortunately, the ATi chip used only suits the most basic gaming and media editing. The same is true of the home and office abilities of this machine. Despite using a dual-core processor, the performance is suited to home and office applications. There is still ample power for most daily use, but don't expect the cutting-edge power of the Samsung R580, for example. Another flaw is the less than pleasing keyboard. Many keys are small and thin and placed too closely together, making it easy to strike adjacent keys when typing. Another frustrating choice is that the left Ctrl key is indented, making it less accessible than on rival machines. More pleasingly, build quality is generally excellent. Resilient plastics have been used and all panels feel firmly attached throughout. The black and gunmetal grey design scheme lacks the flair of the HP and Dell, but provides a suitably stylish look for the home or office. Inevitably for such a large laptop, mobility is limited. While this isn't the heaviest machine around – weighing just 2.5kg – the 186-minute battery life provides basic mobility; but you can still work comfortably around the home when necessary. A pleasing set of features compensate somewhat for the MSI's flaws, however. High-speed wireless and fixed network connectivity is on offer, an eSATA port provides speedy access to external hard drives and a 500GB internal hard drive provides truly capacious storage for all your data and files. Overall, the CR610-013UK is a competent entry-level media centre and its combination of a stunning screen and Blu-ray compatibility is a rare find at this price. Unfortunately, its poor usability and limited performance prevent it from achieving our highest recommendation.